On a morning when the weather did not know what it wanted to do our second team went out and shone brightly at Robert McCallion Memorial Park. Ballycroy took the lead with the first point of the game but we soon took control and Jason McLoughlin got us going with two fine points. Both scores coming from good work by DarrenCampbell linking up with Jason who did the necessary thing and put the ball over the black spot. A nasty injury ended Peter Quinns game and he was replaced by Joshua Smith. This change did not unsettle the team and soon the good work between Darren Campbell and Jason McLoughlin continued with assistance from Caoimghin McLoughlin and the ball was in the back of the net. Two more points followed from JP Broderick and Darren Campbell got on the board midway through the half we led by 1-4 to 0-1. Ballycroy didn’t come for the scenery and picked off two frees to narrow the deficit. 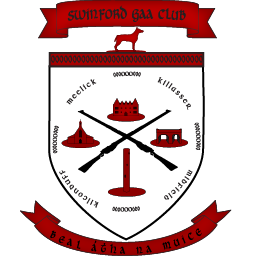 A punched point by Caoimghin McLoughlin and another point from Darren Campbell soon had the lead back to six before Ballycroy got the last score of the half to leave it Swinford 1-6 Ballycroy 0-4. Management made a few changes at the break to keep everyone on their toes and Kevin McDonagh and Enda Heaney entered the fray. Ballycroy started off the better and got a great long range point quickly followed by two more to put only two between the teams. That was as close as it was to get and we took complete control again. First JP Broderick got his second point of the game and Pearse Rowley who came on as a sub knocked one over before JP added his second. Then with a brillant finish Kevin McDonagh netted our second goal to kill the game. A High ball in by Enda Heaney assisted by good work by Pearse Rowley under it fell to Kevin McDonagh who delicately chipped the advancing goalkeeper to put is 2-9 to 0-7 ahead. Ballycroy scored two frees which were seperated by a Enda Heaney free to finish the game Swinford 2-10 Ballycroy 0-9. It continues a very good start to the league and we now sit on four wins from five games. With a good blend of youth and experience the team are enjoying their football and it is showing on the field. The top of the table is very tight and it will require this form to continue to be challenging at the end of the season. Swinford: Damien Geraghty, Aiden McLoughlin, Paul McDonagh, Paul McNicholas, Andrew Lenihan, Peter Quinn, Kevin Barry, Darragh McIntyre, Barry Brennan, Darren Campbell, Gerry Callaghan, Jason McLoughlin, Caoimghin McLoughlin, Michael Prendergast, JP Broderick. Subs Joshua Smith, Kevin McDonagh, Enda Heaney, Pearse Rowley, Aaron Kinsella, Gavin Moore.